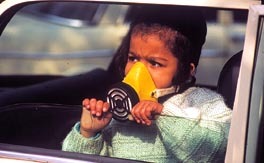 Paediatric asthma incidence is associated with exposure to traffic-related air pollution (TRAP), but the TRAP-attributable burden remains poorly quantified. Nitrogen dioxide (NO2) is a major component and common proxy of TRAP. In this study, we estimated the annual global number of new paediatric asthma cases attributable to NO2 exposure at a resolution sufficient to resolve intra-urban exposure gradients.